The night that honours the work of real life heroes had finally arrived. The much appreciated Pride Gallantry Awards hosted by Star Plus took place in Mumbai on Sunday evening. This award function is organised to felicitate the work and efforts of the Indian Military and Police Force and appreciate their bravery. Several big names from the entertainment industry were seen gracing the event with their presence. Some of which were Bollywood actor Arjun Kapoor, TV actors Karanvir Bohra, with wife Teejay Sidhu, Surbhi Jyoti, Vivian Dsena with wife Vahbiz Dorabjee, Deepika Singh, Rashami Desai, Mouni Roy, etc. The gorgeous Mouni Roy was the one to open the show with her fabulous performance of Durga/Ganesh Vandana. The actors looked stunning in their attires with actor Surbhi Jyoti, Vahbiz Dorabjee and Deepika Singh stealing the show. These actors were seen having a gala time while they enjoyed the entire show. Actor Karanvir Bohra, his wife Teejay and his co-actor Surbhi Jyoti was also caught taking a selfie while the shutterbugs were busy clicking the trio’s pictures. 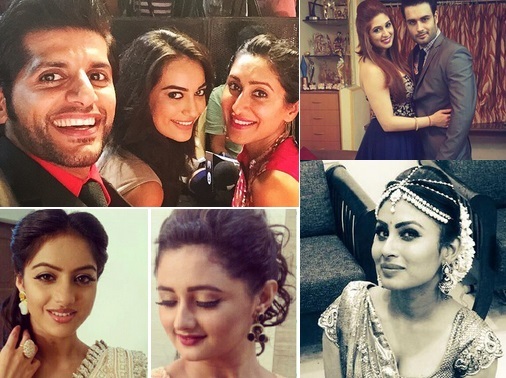 We bring to you some of the top clicks shared by the stars before or during the awards. Take a look. Indian TV : Top 5 Shows That You Definitely Should Not Miss Tonight!